GATE EEE Syllabus 2019 Pdf: The Graduate Aptitude Test in Engineering will be conducted by IIT, Guwahati. The aspirants who are going to participate in GATE 2019 exam, they will require the GATE EEE Syllabus Pdf for their preparations. The aspirants will be able to study according to the topics related to the exam. You can Download GATE Electrical Syllabus here on our page. You can also check GATE Exam Pattern for EEE. The aspirants are advised to prepare according to the syllabus and exam pattern if they want to qualify the exam. The aspirants who will study according to the GATE 2019 syllabus of EEE, they have maximum chances to crack the examination. The GATE Syllabus is divided into three parts, they are Engineering Mathematics, Electrical Core subjects and General Aptitude which is common for all streams. The Graduate aptitude test in engineering is conducted for the aspirants who want to get admissions in post graduation courses in IITs and NITs. GATE is a very prestigious competitive exam. 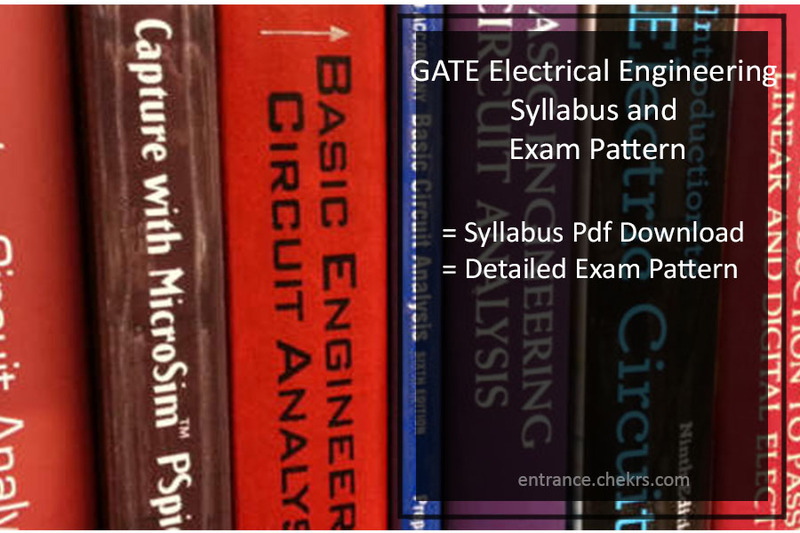 The aspirants have to prepare according to the difficulty level of the exam They are required to study properly according to the GATE Electrical Engineering Syllabus. The GATE 2019 Syllabus for Electrical Engineering is given below. The aspirants have to study according to the exam pattern. With the help of GATE Exam Pattern for EEE, aspirants will be able to increase their efficiency to complete their exam. You can solve the question according to the weighatge of the questions. The GATE Exam Pattern includes two parts first is General Aptitude and the other one is Engineering mathematics and electrical core subjects. Total 65 questions will be asked in the exam. The exam will be of 100 marks and duration of 3 hours will be provided to the students.Here we have mentioned GATE Electrical Syllabus weighatge in the table. For more queries and feedback regarding GATE 2019 syllabus and Exam Pattern, you can contact us by commenting in the comment section given below.